The Channon Children’s Centre is a non-profit community Preschool, which offers a Preschool Program for children aged 2.5 – 5 years. We have a wonderful management committee which is made up of parents and community volunteers, who contribute time and energy to help make our centre vibrant and diverse. 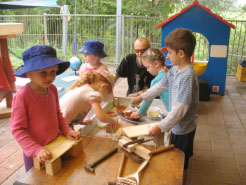 Our Preschool Program is facilitated by passionate and experienced Educators who embrace The Early Years Learning Framework and value working in such a beautiful environment and community. We are continually improving our learning environment and have just added a “Dinosaur Garden” and “Gravel Pit” to enhance children’s sensory experiences at Preschool. Today the Preschool is the charity of the day and we will be offering tasty cakes and treats from the shed, as well as a BBQ lunch and tea/coffees, please come and say hello. We appreciate your support today, please give generously to our fundraiser!